The Native American Indians venerated their dead and grave posts were used by some tribes, particularly the Ojibwa (Chippewa) to commemorate the life of a brave warrior or chief. The picture drawings on grave-posts consisted of symbols that represented the life of the deceased Native American Indian, his family, his deeds of courage against enemies or during hunting parties and also and wounds that were received in battle. Grave Post Symbols were not a complete record of the life of the deceased and often only used as a memory aid to those who knew his story and understood the meanings of the symbols that had been used. Grave Post Symbols are a form of picture writing, or Pictogram, which uses symbols to tell a story. The grave post symbols bore pictures or marks telling about the dead man. 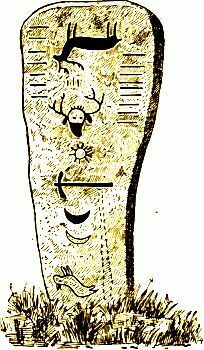 His totem animal was often represented, usually upside down to indicate that the bearer of the emblem was dead.